It has been a great year for board games! For me, personally, it has been a wonderful year as I’ve reconnected with old favorites, discovered some new favorites, and sealed the deal for a lifetime gaming partner that’s almost as geeky as me! For the boardgaming community, 2010 has blessed all of us with some great independent success stories, allowing new ideas from the “little guys” to trickle into the market. We owe a greater depth in variety and fun gameplay because of the efforts of backers on kickstarter.com and the print-on-demand wonders at The Game Crafter. No year – and, truly, no blog – would seem complete without a little retrospective. And, so, I bring you the Dice Hate Me 2010 Game of the Year Awards! Just like our compatriot GeekInsight over at Giant Fire Breathing Robot, the contenders for the Game of the Year aren’t limited to those games released in 2010 – the field of entrants is open to any game to which I was introduced this year. The list is large and the competition fierce, but after careful consideration, there is a clear and well-deserved winner. To some readers this award will come as no surprise, but when I interviewed Clever Mojo Games owner and publisher W. David MacKenzie and designer Tory Niemann back in August, I had no idea that their little Kickstarter-backed game would be any good. When David offered me a review copy I eagerly accepted, but the fact that it involved so many dice just left me feeling, well… scared. When I rolled those first few dice in November, all fears were replaced with a sense of unbridled joy. Alien Frontiers is the Dice Hate Me Game of the Year because fun and elation continue to grow every time this little gem hits the table. In honor of Alien Frontiers receiving the 2010 Game of the Year Award, Dice Hate Me will be hosting a very special and exclusive New Year’s giveaway contest. Be sure to check back here tomorrow for more information on how to enter. Believe me, if you’re a fan of Alien Frontiers, plan to buy a copy in the future, or are just excited about games in general, you won’t want to miss out on this contest! Although the first print run of Alien Frontiers is sold out, the second print run should be available March 31, 2011. Pre-ordering is now available at the Clever Mojo Games website. In the meantime, read my review and watch Dice Hate Me for more news and updates as the second print release date draws near! I’ve played many, many games over the years but rarely have any of them challenged me as much or engaged a larger portion of my brain as Twilight Struggle. It is a grinding, mindbender of a two-player grudge match that is certainly not for the impatient or weak of will. For those players who accept the challenge, Twilight Struggle’s gameplay offers an incredibly unique integration and simulation of historic events during the Cold War. 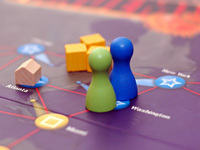 Every single decision in the game is tantamount to success and tension mounts at each turn as players consider the global consequences of their actions. If I were to summarize Twilight Struggle in one word it would be intense; if I were afforded just one more: masterpiece. Given the game title and a theme steeped in the Samurai tradition, one would expect Shogun to be just another battle for supremacy across war-torn battlefields. Thankfully, Shogun is far deeper and much richer than that. Players not only must protect their borders from encroaching Daimyos – they must also balance order within their provinces, build temples and other structures, and appease and feed their people before a revolt forces enemies to grow from within. A show of power and a clever avoidance of battle typically benefits the most successful players. 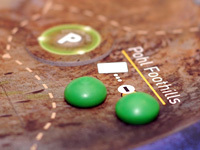 However, when armies do clash, the outcome is decided by flinging little cubes into the Battle Tower – a fun and unique combat system that can use the power of the people in the fields to turn the tide of war. And now for something completely different. I figured all of you would appreciate another voice for a proper look back at 2010, so I proudly present to you a fledgling gamer’s perspective – my wife, sometimes known as The Sphinx, but more commonly referred to as Monkey238! a) He wants to show off that he married an awesome girl. b) He wants to spark some interest in other potential gamers. c) He wants to alleviate some of the writing responsibilities this week. Whichever may be the case, I am willingly giving you my two cents as a show of love and support to a man who is as passionate about board games as he is about me. And choosing my Game of the Year is not an easy task, mind you, due to the fact that as of this publication date, I have learned 38 – yes, thir-ty-eight – new games in 2010, which is more than I had known in my cumulative prior 33 years. That’s what I get for marrying a geek. Yet I have confidently narrowed down my database to three games which have riled up obsession, gloating, and limited sleep due to the fun that I have had playing them. By far my favorite game, indicated by my addiction to play until we win despite the unfavorable statistics that have indicated that winning only happens 25% of the time. I love the chaos (due to epidemics, mutants, and viruses), the collaboration (Chris and I get to play on the same figurative side of the board to discuss strategy), and, dare I say – for fear of tainting my nerd card with geekiness – the feel of the small wooden cubes. My nerd card gets bonus points, as I am willing to stay up until six in the morning to relive the crazy, historical events of the Cold War, from either the perspective of the U.S. or the U.S.S.R. I am intrigued by how accurately the game play mimics the ebb of tensions existent of the true events, the cool card graphics, and the tiny degree of exhilaration I feel when I rule over the entire world. This game is fun. Period. I get to use special galactic powers, kick opponents’ spaceships off the board, and colonize other worlds. Enough said. They’re all fantastic games, believe me. I would think you might be able to get someone in your house to play Alien Frontiers or Pandemic with you. They’re very approachable. Pandemic would be especially good since you can guide them through the first game fairly easily since it’s cooperative. You’ll have to see if you can hit some conventions next year – there will be plenty of people there that will play these with you! Okay, okay – I yield! I just went and preordered Alien Frontiers. If it’s not as totally awesome as you say, I’ll expect full compensation. But otherwise, I have to agree with all your choices. Pandemic is my favorite game, so your wife definitely has great taste in games (and husbands, I suppose). Chris – Hah, talk about pressure! I really hope you like it, but I’m pretty sure you will. We still want to get over to Burlington soon – the holidays just have us slammed! Oh, and your praise of Hansa Teutonica has me obsessed with trying to find a copy – I have one on order right now. On another note, being named Chris certainly can’t hurt you in the contest, let’s put it that way. Alien Frontiers for Game of the Year, eh? I’ll have to keep an eye on it. Also, my wife is in total agreement on Pandemic. Her favorite game by far. Well, I do have a disclaimer that even though dice hate me, I still like them – the little bastards. Thankfully, Alien Frontiers negates some of my bad dice karma. With the array of choices, a bad roll can still keep me in the game. Pandemic is my wife’s favorite game right now as well. My plan to turn her into a gamer is two steps closer to completion after introducing her to it and Innovation (an awesome card game by Asmadi Games) this year. Twilight Struggle is currently at the top of my list; my buddy and I have not played a single other game together since we discovered it a few months ago. To make even more progress on the quest to turn ordinary people into gamers, I have purchased Puerto Rico to give to my brother and his girlfriend for Christmas. They have definitely enjoyed Agricola the 2 or 3 times we have played it and have gotten a kick out of a few sessions of D&D, but they aren’t really gamers themselves. He’s really into Samurai, though, so after your review I’m thinking about exchanging Puerto Rico for Shogun… I haven’t played either one, so I’m wondering if one is any more or less of a ‘gamer game’ than the other I’m shooting for approachability and a playing time that’s not too terribly long, but I still want them to have a proper game to call their own. Any thoughts? Thanks for a great website. Thanks for the comment! I would like to try Innovation – I’ve heard great things about it. I may have to get a copy for me and monkey to test out. As for your Puerto Rico/Shogun dilemma – I’m torn on that. I would say that if your brother and his girlfriend enjoy Agricola, they may take to Puerto Rico more easily than Shogun. The mechanics are far similar and Shogun has a land management/war game aspect that may be a bit foreign for non-gamers. I have played both, and I love both; as a matter of fact, if I had a third runner-up, it would be Puerto Rico. One drawback to Puerto Rico for most non-gamers is that it requires 3 players. For that reason, Agricola is actually a far better choice for most as it plays really well with two players and scales up really well for more. San Juan is also a great game in that respect – a smaller version of Puerto Rico, but all card-based, and great with 2, 3 or 4 players. Hope this helps! I’m glad you pointed out that Puerto Rico is a 3 player minimum. I was shooting for something the two of them could play when they move out of state together before they meet anybody else! Darn, it looks like Shogun recommends at least 3 as well. If only my FLGS had Alien Frontiers… It looks awesome. I think what I’ll do is stick with Puerto Rico but tell them to treat it as a gift certificate to the local shop so they can pick out a game themselves. Maybe Race for the Galaxy… or Carcassonne… who knows? Well, I’m off to study the rules for Napoleon’s Triumph– I’m excited about my first play of it tomorrow. Thanks again! Nice to hear Monkey238′s opinions and recommendations. I would normally never have looked at Twilight Struggle or Alien Frontiers but with your recommendation I will certainly take a look. Pandemic is such a great game for those looking for a collaborative evening of escalating apprehension. If Pandemic was your game of the year, what is you favorite game overall? 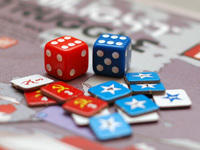 Lovely site, lovely to hear of anothe gamer with a dedicated geek wife, actually met mine playing risk online. Nice to see Shogun and Twilight Struggle get some big ups, even if they both came out years ago …. But seriously Pandemic? It’s not a game it’s a choose your own adventure book! Did you get to Essen this year, if you didn’t, I recommend Magnum Sal, London and Poseiden. See you on twitter no doubt! Ian – Welcome and thanks for the compliments! I know that putting games that were published in the past into my “Game of the Year” selection was controversial, but the best should go up against the best, right? 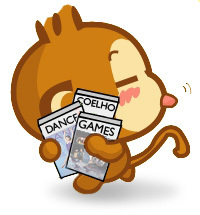 As for Pandemic, you’d better be quiet – Monkey238 will use her Chinese Ballet Fu on you! I did not make it to Essen, but I have always wanted to go. I’ve heard great things about all of the games you recommended, especially Magnum Sal. I’ll definitely have to check them out. More games, more games! Cheers!